Achieve your dream smile with a conservative cosmetic solution from your Huntersville dentist. Small changes can produce dramatic results! Porcelain veneers are a purely cosmetic treatment to hide your smile flaws. If you have a minor smile flaw that keeps you from showing off your teeth, then veneers could be the cosmetic solution for you. Dental veneers are custom made of thin shells of porcelain material bonded permanently to the front of your teeth, giving you a smile that looks picture-perfect and functions naturally. 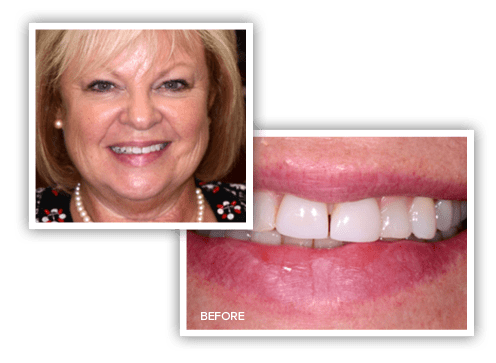 We gave Kathy a stunning new smile quickly and easily with porcelain veneers. Check out more smile stories from our patients! You can finally love every inch of your smile with a simple and durable cosmetic fix. After your initial consultation, dental veneers can take your smile to the next level in as little as two visits with Dr. Merrill! The preparation required varies for each individual; however, modern dental veneers require minimal removal of existing tooth enamel. No one will ever guess you’ve had work done. Your veneers can perfectly match your other teeth or whiten your smile for good. Veneers require a high degree of technical skill, artistic ability, and advanced planning because of the ultra-thin, translucent porcelain material. Your cosmetic dentist needs to work with the shape of your teeth and carefully design the color of the veneers to achieve a lifelike smile. Only a dentist with exceptional training, talent, and experience can guarantee your smile makeover is genuinely life-changing and natural. Superior Esthetics—Dr. Merrill’s attention to detail and artistic talent shines through his many smile transformations. 5-Star Cosmetic Dentist—Dr. Merrill’s reputation is well known and documented in the Huntersville area. AACD Accredited—Dr. 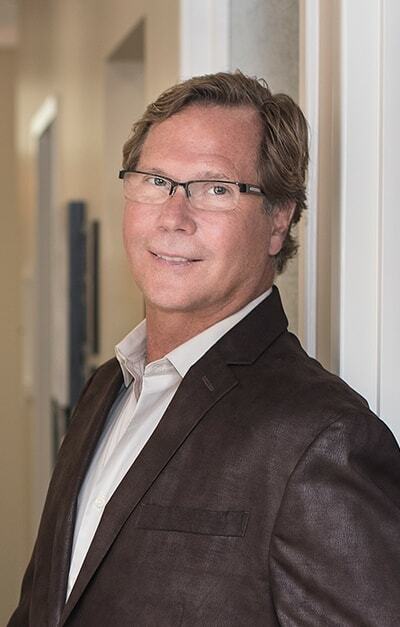 Merrill is committed to continued education to enhance his skills and knowledge in cosmetic dentistry. At your cosmetic consultation, Dr. Merrill will give careful consideration to your situation and the available treatment techniques. He works with a talented lab technician to individually custom design each veneer with unique characteristics built into each tooth. Why Choose an AACD Accredited Dentist? As an AACD accredited dentist, Dr. Merrill has undergone rigorous testing and many hours of continuing education. As his patient, you can be confident that he’s one of the best. In fact, there are less than 400 AACD accredited dentists in the world. You are in good hands! 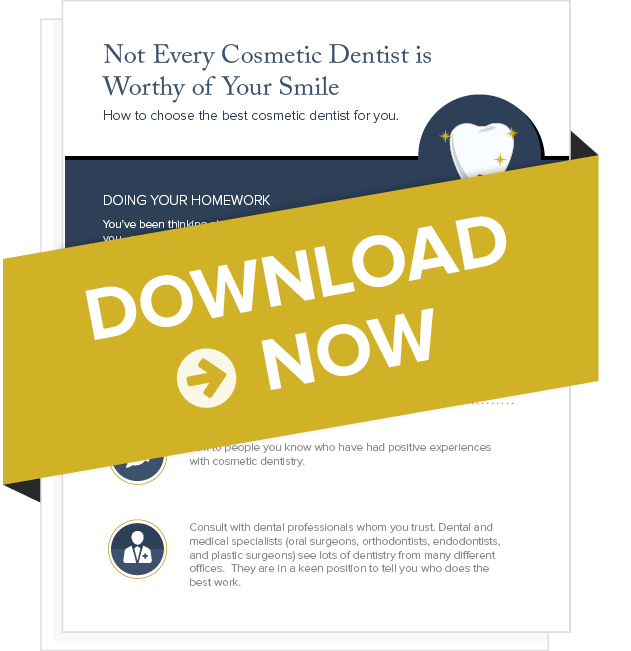 Download your free copy for tips on choosing the right cosmetic dentist for you! Still Have Questions About Porcelain Veneers? Your Huntersville cosmetic dentist has the answers. 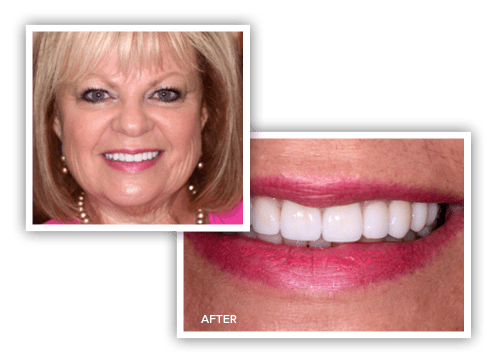 Why choose porcelain veneers over crowns? Porcelain veneers require much less shaping of your natural tooth as compared with dental crowns. Veneers are stain resistant and made of durable material to resist chipping or cracking. Since a dental veneer is bonded to the surface of a healthy tooth, a crown or dental implant may be your only option if you have extensive decay or damage. Not all patients are candidates for porcelain veneers because space must be created for the new layer of porcelain material to attach on the surface of your teeth. However, Dr. Merrill has the expertise and skills to use dental veneers to correct numerous minor smile issues. At your initial cosmetic consultation, he will examine your smile, discuss what you dislike about your teeth, and outline a treatment plan to meet your smile goals. Initial consultation: Dr. Merrill will examine your teeth and listen to your concerns and smile dreams. He will outline a treatment plan based on your budget, needs, and his extensive training. He will patiently answer any questions you may have about your procedures and will never recommend services he doesn’t feel are necessary. Preparation: At your next appointment, your cosmetic dentist will remove as little enamel as possible from the front of your tooth to achieve the desired results and make room for the new porcelain veneer. Your custom-crafted veneers will be created by a dental lab, based on your dental impressions. Your new smile will already be taking shape as you leave the office with temporary veneers. Bonding: Dr. Merrill will ensure your new veneers are perfectly matched and fit accurately before bonding them directly to your teeth with dental cement. You’ll walk out with a stunning new smile and the confidence that goes with it! When designed and placed by a skilled cosmetic dentist, like Dr. Merrill, veneers can last 10-30 years with the proper dental care. The durable, stain-resistant porcelain material will stay bright, white, and healthy. You deserve a show-stopping smile that you can wear with confidence.